Pro Watercross is excited to introduce a recreational tour designed for personal watercraft (PWC) enthusiasts that will feature seven events taking place throughout the 2019 season, in beautiful locations ranging from the Florida Keys to Upstate New York. The Rec Tour in 2019 will bring a new aspect to the Pro Watercross lineup of personal watercraft events, said Pro Watercross CIO Jennifer Handler. “The Rec Tour will focus on PWC enthusiasts as well as on the PWC athletes that the rest of our events and tours cater to. Recreational events draw many people that are already involved in our Pro Watercross competitions, either as an athlete or a spectator, but they also bring new people into the PWC family. Each event in the 2019 tour is expected to draw 300-500 participants, and this will be the “largest gathering of PWC enthusiast in the country,” Handler said. The Daytona Freeride, a long-time favorite among personal watercraft surf riders and spectators alike, will take on even greater significance in 2019, as it will serve as the premier event of a new personal watercraft tour under the Pro Watercross banner. The Daytona Freeride is a perfect example of the popularity of these recreational events. The Daytona event has amazing participation – is the largest gathering of personal watercraft enthusiasts worldwide. Anchored at each end of the tour by two industry staples – Daytona Freeride in January and Jet Fest in September, the 2019 Rec National Tour also features a few brand-new events, and has brought several new promoters into the Pro Watercross family. Each event in the Rec Tour will feature either a purely recreational activity, or a competitive event, but all events will highlight the fun side of personal watercraft. The recreational events – whether it is a poker run, a scavenger hunt, a sightseeing tour – are more inclusive, often family-friendly events that will highlight the more relaxed side of personal watercraft than the edge-of-your-seat, wire-to-wire competitions that Pro Watercross is famous for. Even the competitive components of the Rec Tour, such as the Daytona Freeride, will highlight the more laid-back, fun-in-the-sun side of the personal watercraft sport, Handler explained. The Daytona Freeride, held in January 17-20 in Daytona, Florida, offers surf riders the chance to show off their expertise as they compete in battle rounds featuring both aerial stunts and mastery of the waves. Freeride and freestyle legends and champions such as Mark Gomez and Bruno Jacob are often seen piloting their custom machines through the Daytona surf right alongside sport newbies and novices; it is truly an event for everyone. Next up on the tour, WaveDaze will be held April 12-14 in Virginia Beach. Known not only for the challenging surf conditions and the event’s dual-emphasis on promoting personal watercraft as both a recreation and a sport, WaveDaze also gains significant recognition for their community involvement – all funds received at WaveDaze – whether through registration fees, corporate sponsors or raffles during the event, benefits local charities. Hosted by The Virginia Beach Wave Junkies, WaveDaze started out in 2007 with 60 skis, and has raised more than $40,000 for charity. “We are expecting more than 300 participants from 31 different states in 2019,” said event organizers, adding that this year’s event will include raffles, auctions, games, a custom watercraft competition and the Neptune Challenge open ocean endurance ride, as well as the freeride competition. The third event will bring the Rec Tour back to Florida May 18-19 for the Dunedin Invasion hosted by Florida Ski Riders. The two-day event held in Dunedin, Florida and will include a relaxing, scenery-filled ride through some of the Florida’s beautiful Gulf coast islands; Anclote Island, Caladesi Island and Clearwater Beach. The Dunedin Invasion draws PWC enthusiasts from all over south eastern United States boasting upward of 400 riders in recent events. Next up on the 2019 Rec National Tour will be Operation JET-EX, a new Mid-Atlantic region event hosted by Take Point Now – a veteran support organization founded by Iraq veteran P.K. Ewing, who turned severe battle injuries into inspiration and a goal to earn the world record for riding a jet ski across the Atlantic Ocean in record time. Scheduled for the weekend of June 15th, the event will feature both a long and short distance ride (The “Strike Package” and the “Interceptor Mission” respectively) for the big machines, and a slalom contest called the “Take Point Now Slalom Shootout,” Ewing said. Additional activities such as a “cannonball run” are being considered for Sunday. This event, open to veterans and the general public, will be both a fun, recreational event, and serve to bring healing and service to the veteran community. We are currently working on our second prototype which will be for individuals that are physically impaired. We are sounding a call to other veterans and members of our society who may feel isolated and are seeking objective driven, team-oriented experiences,” explains the organization website. Following Operation JET-EX, the Rec Tour will head to New York’s Atlantic waters for the July 6th – Strong Island Poker Run. 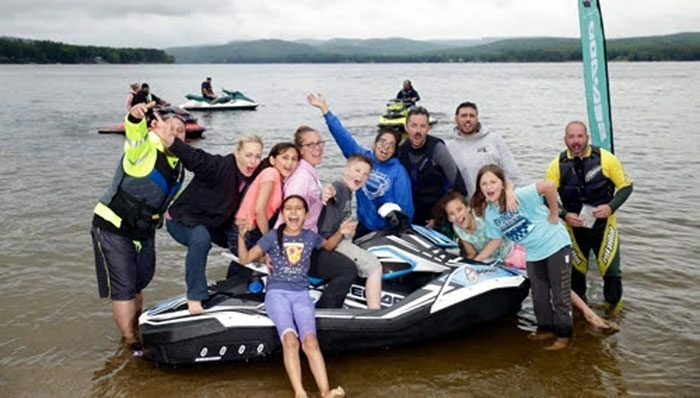 Hosted by Strong Island Jet Skis and by organizers Mo Sherif, Jamie Araya and Freddie Aries, the poker run will up the ante on your typical recreational ride by adding in a hand of poker. “A poker run is an organized event where participants using boats or jet skis must visit five checkpoints, drawing a playing card at each one. The object is to have the best poker hand at the end of the run,” Sherif explained. The sixth stop on the Rec Tour is destined to be a tour favorite; sponsored by Broward Motorsports, the scenic August 3rd – Broward Motorsports Rec Ride will visit Key Largo, this ride will take participants through The Florida Keys and out to visit the beautiful and popular “Alligator Reef Lighthouse” for some exploring and snorkeling. This area is amazing! Closing out the 2019 Rec National Tour will be Upstate New York’s popular JetFest, scheduled for September 7th, JetFest is hosted by WetWerX Water & Snow, along with Watercraft Network Radio, and produced by Northeast Watercraft Alliance. 2019 will be the 12th season for JetFest, which makes it the longest consecutive running PWC event in the Northeast, and it also annually yields the largest PWC turnout in the region, according to event organizer Wayne Ordon. Like WaveDaze, JetFest donates 100 percent of the registration proceeds to charity. Held in a beautiful, full-service forest campground in the Adirondack Mountains on the Great Sacandaga Lake, JetFest features more than 100 miles of shoreline, a crystal-clear lake, and a “Duck Hunt” scavenger hunt and a freestyle Shootout entertains riders as they enjoy a barbecue lunch on the beach. “This 2019 Rec Tour is going to be a game-changer and will be good for the industry all the way around. It will help the competitive side by bringing attention to the sport, and by giving potential athletes a low-barrier entrance in to the sport. Most importantly though, this tour shows what great people are within the PWC community and how they are working to improve the lives of the people in their communities through the different charities that they represent,” Handler added. In honor of the inaugural Rec Tour season, Pro Watercross will present a commemorative coin to the first 300 participant at each event. Each commemorative item will be unique to the event. For more information on the 2019 Rec National Tour presented by Pro Watercross and to keep up on all the details of the tour stops that will be coming out in the upcoming weeks and keep up with all things Pro Watercross by following along at prowatercross.com.